THE FREESTONE FAMILYextracted from "
The name Freestone appears in some of the oldest parish records in England in various forms, such as Fryston, Frieston, Friston, Freston and Freestone. The Oxford Dictionary of English Place Names has the origin of the name as follows: "Freston, and the many variations all come from the same source, an old Frisian settlement on the east coast of England. Friesa (old English) a Frisian; a settlement or estate. Thus the parish Freston, or Fryston, was a place where the Frisians settled." "Freestone, Freeston, relates to the old Frisian settlement, and it appears that the original settlers are from the Frisian Islands, a chain extending from the coast of North Schleswig to the Zuider Zee now a part of the farm land of Holland obtained by pumping the sea water from behind the dikes). Frisian, the original speech, resembles the older form of English. "East Anglia, including Norfolk, Suffolk and Cambridge, was founded by Uffa, 575 A.D. It was then the Frisians appeared, some of whom had the name Friston, Freeston, and Freston, clapt on them when surnames became fixed, probably because they had all the appearance of their distant ancestors of some six or seven centuries previously. Thus the family of Freestone, as they are known at the present day.
" Freestone is a corruption of the name Freston, and Youngman (connected with the Freestone line by Marriage) is a corruption of the name Yeoman. Look at this parish register entry from Flixton, Suffolk: 'Elizabeth, daughter of Thomas and Elizabeth Freston bap. 12 Dec. 1756." Later entries corrupt the name into Freestone, due perhaps to an ignorant clerk and doubtless to the broad Suffolk dialect. No wonder there are so few entries to be found anywhere of a Youngman - as the name is Yeoman, who was the owner of his own farm. The yeomen of England were a great race of fearless independent people who brooked no interference in their domestic affairs from King or Parliament. Wars caused them to be gradually reduced; unscrupulous lawyers issued them mortgages at high interest and when there was difficulty in making their regular payments of interest, foreclosed and took the property. Many estates of later 'Gentry' were founded by lawyers who had foreclosed on yeomen, who in some cases -were allowed to continue to live on the farms by payment of rent, but it was theirs no longer. of the nineteenth century were often yeomen class. They were the backbone of England. "The Freestones were a very good landed family. As they became more numerous they declined in worldly goods, were yeomen, then tenant farmers. Some sought a living away from the land. A branch of the Freston family was at Warnifield, Yorkshire." Further research on the part of Mr. Sunderland reveals the fact that the Thomas Freestone branch of the family, came originally from Yorkshire, for they are found in Atltofts, Yorkshire before they appear in Norfolk and Suffolk. Richard Freestone of Mendham, Norfolk, fourth in descent from John Freestone of Alltofts, Yorkshire had six sons by his second wife, Cecily, daughter of Thomas Felton of Playfield, Suffolk. Thomas Freestone No. I in this family pedigree, seems to have been a descendant of one of the sons of Richard of Mendham. THOMAS FREESTONE was born in the year 1724/25 in England, town and county unknown. Research has been going on for many years, but it is only recently that relationship has been established between Thomas I and the Freestone family in the United States. From the Genealogical Library in Salt Lake City, and through the efforts of Janet Freestone of Los Angeles, this relationship is now definitely established. Janet is a member of the Freestone family living in Ogden and Bountiful Utah, also in Idaho. Their connection is through Thomas I and his son Jacob, brother of George, from whom this family is descended. Bans of the marriage of Thomas and Elizabeth Weyit or Wyatt, were published in South Elmham, Suffolk, the old family home. He died 24 March, 1812, at the age of 87, and Elizabeth died 13 November, 1793, in her 68th year. GEORGE FREESTONE, son of Thomas and Elizabeth Wyatt Freestone, was born 10 December 1760, at Flixton, Suffolk, England. He married Ann Youngman, daughter of Richard and Elizabeth Youngman, 3 November 1789, at St. Peters Church, Flixton, Suffolk, England. She was born Z7 November 1763, at Flixton, and died Z4 February 1830. He died in 1849, his age being given as 88 years and 88 days. George, b. 12 Sept. 1791, Flixton; md. Frances Vincent; d. 25 July, 1852. Sarah, b. 21 Nov. 1793, Flixton; md. William Ward. They moved to Canada. Thomas, b. 10 May, 1795, Flixton; md. Ann Fall, d. July 1858. Mary, b. 5 July, 1798, Flixton; md. Robert Buck; d. 14 August, 1886, age 88. John, b. 12 Sept. 1800; Flixton, md. Susannah. Rhoda, b. 2 August 1802; md. 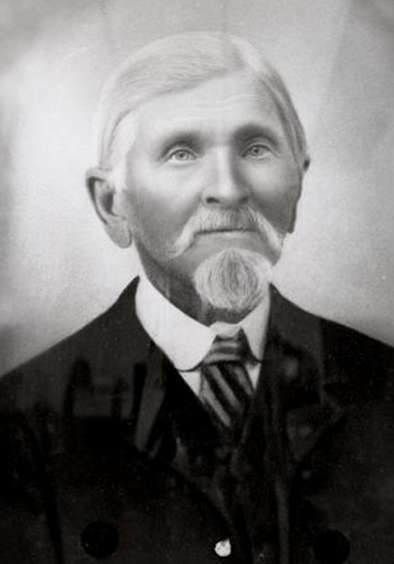 Mr. Hammond; d. 22 Sept. 1855, age 81. Henry, b. 21 October, 1806. THOMAS FREESTONE son of George Freestone and Ann Youngman, is the father of the eight children and their descendants about whom this book is concerned. unknown. He met Ann Fall in one of Canada's provinces, Prince Edward Island, and they were married 4 August 1836, when he was 41 years of age and she was 24. In the diary of George Freestone, eldest son of Thomas, written between 1895 and 1896 when he was in England, he speaks of visiting relatives in Suffolk, principally Flixton and Bungay and reading old letters written to relatives of Thomas and Sarah from Canada. Is told in detail in the life story of James Freestone. Surprisingly little is known of Thomas. Jane the youngest of the family describe 9 him in a letter to her nephew, George L. Freestone. However she says she does not remember him as she was very young when he died, but was told by her mother that he was dark of complexion, moderate In height and "heavy set". Others remember him vaguely as a restless person, always looking for new frontiers. In July 1858 he left Alpine to go South where he was stoned to death by Indians near Parowan, Utah. His burial place is unknown. From the pioneer life stories written by members of his family, it Is evident that they were left in a destitute condition. Ann Fall, daughter of James Falland Elizabeth Rouston, wife of Thomas appeared to be the dominating religious influence in the family and it was her faith and courage that kept the family together. She implanted in them trust in God and loyalty to their church. George, b. 13 Aug. 1838,Prince Edward Island. "My parents immigrated to the state of Ohio and settled on 40 acres of land in Harden County. They had a great deal of sickness and the farm was mortgaged for debt and sold. We went to Sandusky City and stayed there a short time, then went back and bought 20 acres of land. We started to clear up this farm when we heard the message of Mormonism from the traveling missionaries. "Previous to joining the Latter Day Saint Church my parents belonged to the Methodist Church. They were anxious to gather to Utah with the saints after joining the church. They heard the Mormons worked cows so sold their little farm for a light wagon and hitched up two unbroken cows to the little wagon, put our effects on it and started for Zion, distant about 1700 miles. "Previous to Mormonism coming there I made it a matter of prayer, though then about nine years of age. I went into the woods every day and prayed to the Lord that if he had a people upon the earth that I might belong to his people. I afterwards went to hear the first Latter Day Saint sermon I ever heard. I believed every word of it. I do not remember that I have ever doubted it since. My brother carne for me to come home to go with them (he was living with a family who gave him room and board for his work). I felt entirely convinced and was entirely willing to go. We started in August, 1852. We averaged about 12 miles each day. We traveled through rain and mud and landed in the territory of Iowa at a place called Pisga on the 25th of December in a big snow storm, then one hundred miles from Council Bluffs. "Winter set in and we had to stop. We had no money and we worked around and got something to eat. We were in very hard circumstances. My mother wrote a letter to the president of the branch at Council Bluffs. The letter was read in meeting and caused many to shed tears. They sent word back that if we could get there they would help us through. We stayed there a portion of the winter, then moved 20 miles to a place called Mintsat. My brother and I cut saw logs and husked corn. We got cornmeal and fat beef for pay. One of our cows died during the winter. We had a two year old heifer we hitched in and we started early in the spring and we reached Council Bluffs in April. "They organized a company of 50 wagons and we joined the company. They let us have a young yoke of cattle to work with our cows. I drove sheep barefoot, a thousand miles, across the plains. We started on the 10th of June, 1853. 1 was then 12 years old. A man accompanied me and we had a horse which we changed in riding. We had a good journey across the plains and arrived in Utah the middle of September. We went to American Fork, Utah County,and lived there one year and then moved to Mountainville, afterward Alpine. We saw hard times at first. The grasshoppers came and swept almost everything off the land and we had to live on greens and pig weeds. The Indians became troublesome and we had to move into forts. President Young came there and counseled the people to build a fort 14 feet high and 6 feet at the foundation, which they did. I worked all summer on the wall. This was in the year 1855. "In the year 1857 the United States army was sent to Utah and all the able bodied men were called out to defend us. I was too young to go but I sent my gun. Peace was afterwards declared. "In the year 1860 1 worked out and got a three year old steer. I bought a mate for it. In the year 1861 the bishop called me to take my young yoke of oxen and go back to the states after immigrants which I did. Two hundred wagons went back that year, four yoke of oxen to a wagon. We started in April and made the round trip of 2000 miles in one summer. ELIZABETH ANN FREESTONE eldest daughter of Thomas Freestone and Ann (Fall) Freestone, was born 26 January, 1847., at Hunterville, Hardin County, Ohio. She was 10 years of age when the family began their long hard journey to the Rocky Mountains. In Alpine, when Elizabeth was 15 years of age, she married John Langston, 20 years her senior, and already married to Clearlinda Phillips. She had two children by this marriage. She was divorced from John Langston and married Lars Rove Jensen, whose first wife, Jane Dawson, had died leaving him with four children, two of whom, Lars and Thomas, were raised by Elizabeth. The Lars Rove Jensens sold their farm in Alpine and moved to Orderville, where they worked in the United Order for five years. Nine children were born to them, two dying in infancy. When Jensen returned from one of his trips to Salt Lake where he sold the garden truck raised on their farm, he brought with him his third wife, Agnes Smith and her five children. She had immigrated from England and had lost her husband. 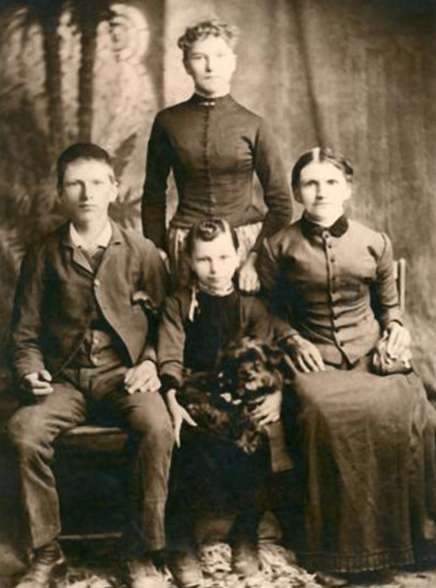 When he decided to move to Provo Bench and make his home, Elizabeth did not want to go with him as her sons, Reuben and Frank were doing so welt in the carpenter trade, and were able to make a living for their mother and family. Reuben built his mother a three room house with a porch. Because of the rugged life that Elizabeth had endured, her health began to fail and when she was 56 years of age she died. She was of medium size, and had dark hair and eyes. She was quiet, gentle and very religious and never missed church. Every evening she would read the Book of Mormon or Bible to her children. She did a lot of sewing and made all tier family's clothing. When she could not sleep at night, she would compose poetry, prose, and songs. She had several books full of her compositions. The two stepsons she raised, paid this tribute to her: She was a wonderful woman. Their own mother could not have done more for them. They never forgot her teachings. "When I was two years old my parents moved to Orderville, Kane County, Utah and joined the United Order. The houses were small and built side by side, forming four wall like a fort, with a large hall in the center. We had Community prayer in the mornings before breakfast and prayer after supper as well as Our meetings in the hall. There was a long table in the hall at which all of our meals were eaten. "We were not allowed to have food in our homes. If we wanted a piece we had to snitch something from the orchard or garden. Brother Robinson blew a bugle to call us to breakfast and supper and at noon a bell rang. All the food was cooked in a big kitchen. There was an orchard and fields of vegetables and cotton. "There was a large herd of cows and we made cheese and butter. There was also a factory where we made our own cloth and blankets. Everyone worked at what they could. My father herded sheep and mother did a lot of spinning and knitting. My eldest brother Reuben, worked in the carpenter shop. Annie worked in the factory and kitchen and Frank worked in the carpenter shop when he was old enough. "After a few years there was so much dissatisfaction among the people that they discontinued eating at the big table and gave each family its supplies, according to its size. I remember of getting a pint of milk cacti morning for our family of seven. We were allowed our flour and so many fruits and vegetables each week. In a few weeks the United Order broke up completely. "Mother had a very mild disposition and was very lovable and good natured. I married David S. Price about three years after my mother's death." Elizabeth Ann Freestone was born 26 Jan. 1842, Hunterville, Ohio. She married (1) John Langston, son of Francis Bell and Elizabeth (Heathcote) Langston, 7 March, 1857, Salt Lake City. He was born 8 March, 1822, London, England and lived at Rockville, Utah, at which place he died 3 Dec. 1882. This was his second marriage. 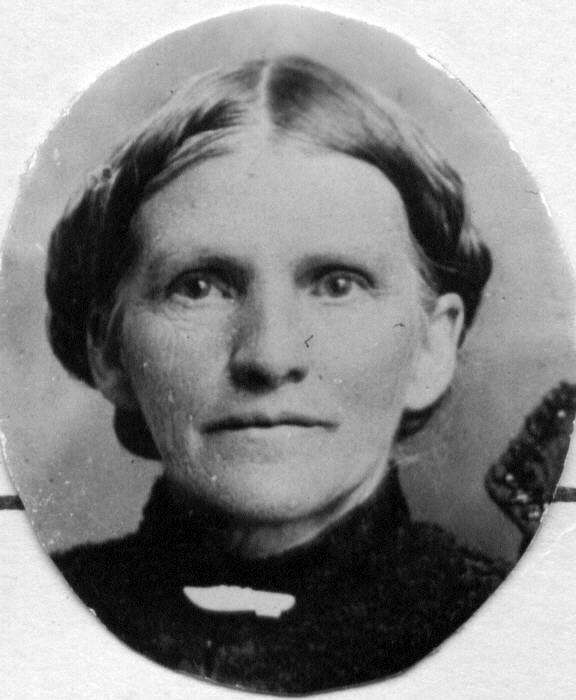 She married (2) Lars Rove Jensen, 27 Aug. 1864, Alpine, Utah. He was the son of Jense Hansen Rove and Kirstine Jensen and was born 3 May, 18Z5, Fredrickshaven, Hjorring, Denmark, and died 9 Nov. 1909, Provo, Utah. This was his second marriage. She died 27 Nov. 1898, Vineyard, Utah. Elizabeth Ellen, b. 4 April, 1858. Louis Reuben, b. 21 March, 1865. Annie Louisa, b. 16 April, 1867. William B., b. 7 Oct. 1869; d. In infancy. Joseph, b. 17 Feb. 1871; died in infancy. James Franklin, b. 31 March, 1872. Leonard Alonzo, b. 7 Sept. 1874; d. in infancy. Rhoda Laura, b. 27 Sept. 1876. Emma Jane, b. 3 Oct. 1879. Robert Samuel Hamilton, b. 29 Jan. 1882; died in infancy. Rhoda Laura Jensen standing in the back. in front: James Franklin, Emma Jane and mother: Elizabeth Ann Freestone Jensen.